The Floating or Levitating Playing Card - Version Three. Here’s a visual trick that you can learn and perform for your friends where you make a playing card apparently float over your hand and slowly spin as a levitation occurs. You're not only breaking the laws of gravity, the card slowly spins in place about a quarter of a turn. This is easy to learn and perform and the clever secret relies on a of that you can easily make from household materials. And if you’re lacking one item, you can easily find it. Just follow our step by step instructions and we’ll show you how. Before you learn this one, you’ll want to see it in action. Click here to watch a video of the levitation. To see more tricks in action, please subscribe to our video channel to watch and learn more tricks as videos are made available. Not to get picky, but most of the easy tricks that involve levitations are actually suspensions because you are placing and leaving an object suspended in mid air. In these effects, the object doesn’t typically move. 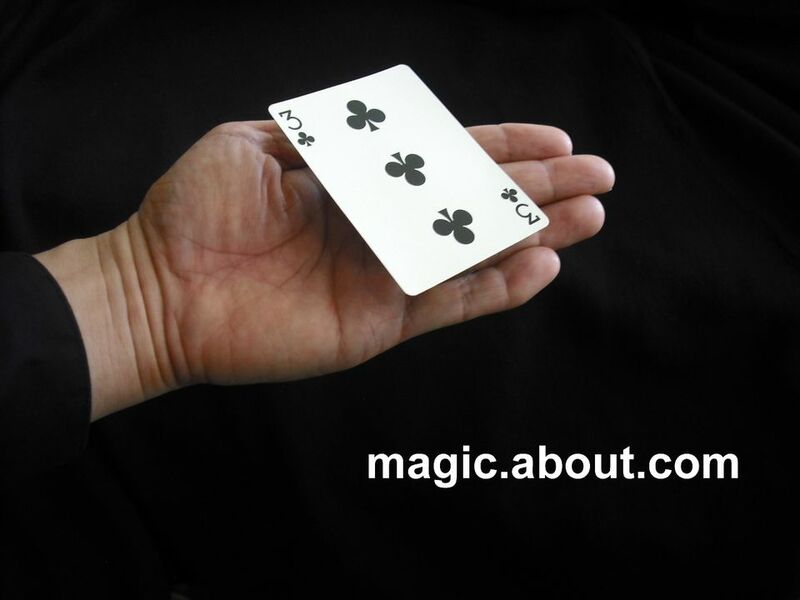 In this trick, the card starts by resting on your hand and then appears to lift off on its own accord. And the slow partial spin adds to the mystery. This easy trick is particularly good for beginners and kids as it requires no complicated moves or . You bring out a playing card and rest it face up on your palm-up hand. After placing the card on your hand, it mysteriously rises on its own until it’s approximately sitting an inch-up in midair over your hand. And as it rises, the card makes a slow, quarter turn. After a brief moment, you grab the card in mid air. Floating Card Version Three - Preparation. A piece of thin, stiff plastic about one-inch by four inches. You can use packaging materials from plastic boxes that contains produce or fruit that you purchase from big box stores. You can also use plastic that is part of a blister pack for many small objects that are sold at big box stores (items in these clear plastic packages include small hand tools, packs of pens, and more). You probably have the very plastic that you need sitting in your refrigerator or recycling bin. It’s probably better if the plastic is clear but you can use any plastic material that will easily flex in your hand when you squeeze the ends. All this will be more apparent as you read the rest of the instructions. As in the picture, place the strip of plastic across the back of the playing card in a lengthwise direction. Using the adhesive dot, attach the plastic strip to the playing card at the centers of each. The dot goes in the middle of the plastic strip and then adheres to the center of the face of the playing card. After attaching the plastic strip to the playing card, use the scissors to trim the edge of the plastic strip so that its edges are aligned with those of the playing card. The plastic strip should be slightly less than the length of the playing card. It will need to hide under the playing card so it’s not seen. I'll assume that you will levitate the card over your left hand. If you want to float the card over your right hand, just reverse the instructions. Bring out the gimmicked playing card. Be sure not to show the side with the plastic strip. With the gimmicked card face-up (plastic strip side down), grab the card with your right hand - fingers along the length-wise portion of the card and your thumb on the other side. Place the card so that the plastic strip rests across your left hand with one end against the base of your left thumb and the other against the base of your left pinkie finger. After positioning the playing card, you should feel the edge of the plastic strip resting against the base of your thumb and the other edge resting against the base of your pinkie. If you need to, use your right hand to casually adjust the playing card so that the edges of the plastic strip are resting in the correct spot. With practice and experience, you'll know when the card feels "right." Twist the card clockwise, a little less than about a quarter turn in place. You’ll feel the adhesive dot resisting the movement. It’s the dot that causes the card to make a quarter turn as you levitate it. Don’t twist the card too far as you’ll expose the plastic strip. Once the card is positioned correctly, let go of it with your right hand. At this point, squeeze your left thumb and left pinkie to apply inward pressure to the plastic strip. You’ll find that the plastic strip will begin to arch up or bow and lift the playing card above the palm of your hand. Try to make the movement of your thumb and pinkie slow and subtle so that it won’t be noticed. The card should just appear to float up off your hand. Also, because of the adhesive dot and the twisting that you initially did, the card will slowly turn as it levitates and rises. It’s important that you watch your angles - where spectators are watching. Ideally, your spectators will be looking down onto the card and your hand. If your hand is at their eye-level, they will undoubtedly spot the plastic strip and they will discover the secret. You can watch a video of the levitation with a playing card here.